In 1999 Deane was commissioned to provide music to accompany four screenings of the 1932 silent film version of “Peter Pan”. Directing his ten-piece band à la Butch Morris (whose conduction methods he knows well), Deane ended up with four different versions of the music, which he mixed together for this album. Some tracks, including the poignant and extremely beautiful “Belonging” (Alicia Ultan’s viola and Courtney Smith’s harp recall the pastoral world of Debussy’s 1916 Sonata), use just one ensemble version, others overlay the four versions to create a dense orchestral sound. The musicians play superbly (soprano saxophonist Tom Guralnick is on smoking form throughout) and Deane’s sampling and mixing is tasty. Recorded during the 1999 Taos Talking Pictures Festival, conductor / alchemist J. A. Deane’s sterling ensemble serves up a heady, swirling brew that trips right through the light fantastic. — David Prince, SANTA FE REPORTER (December 2001) – Voted one of the top five recordings of 2001. J.A. 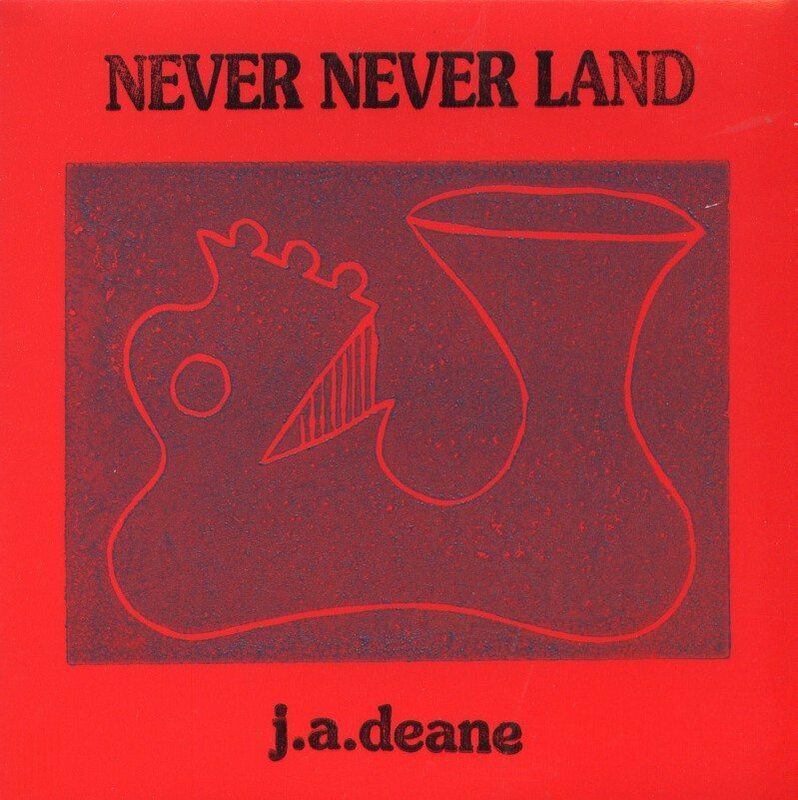 Deane and the Out Of Context Ensemble of Southwestern musicians took on an ambitious project on “NEVER NEVER LAND”. They played a conducted improvisation as a score to the 1932 silent film Peter Pan. There were four screenings of the film with the ensemble, and the music varied each time it was performed under Deane’s guidance. Deane states he used Butch Morris’s conduction method to create the collage of sound. This recording is an amalgamation of all four performances, and Deane at times used multiple and overlapping segments, effectively magnifying the orchestration as much as fourfold. It is an airy and delicious blending of improvised sounds that captures the lightness of the flying scenes and the dense drama of the unfolding storyline of the tale we all loved as children. While the music has ethereal movements in keeping with the plot, it has just as many stimulating and vigorous improvisational segments. Guralnick on reeds, and Weaver and Feld on brass, are the only musicians playing horns. The balance of the ensemble is heard on strings, percussion, or electronic sampling. The music flies on high with lightness and fragility, spiraling upward in intensity to match the magical scenarios of the film script. The cello, harp, and viola set a delicate mood but erupt with thunder in depicting the plight of the children as they encounter adversity with the pirates. The darkness of the tuba and euphonium simulates the tenseness of the capture scenes, while the sampling techniques add color to the drama. The eighteen- minute “Rescue” heard with four ensembles (from the four screenings) is the most robust segment, but the entire recording is a wondrous musical experience. Deane did an extremely commendable job of inspiring the musicians, and the resulting music is an engrossing affair. While the basis may be a children’s tale, the music is for adults, and only those with open ears. Deane’s name is most familiar to me from Zorn’s Cobra and Butch Morris’s conductions, and those are pertinent signposts for this recording. 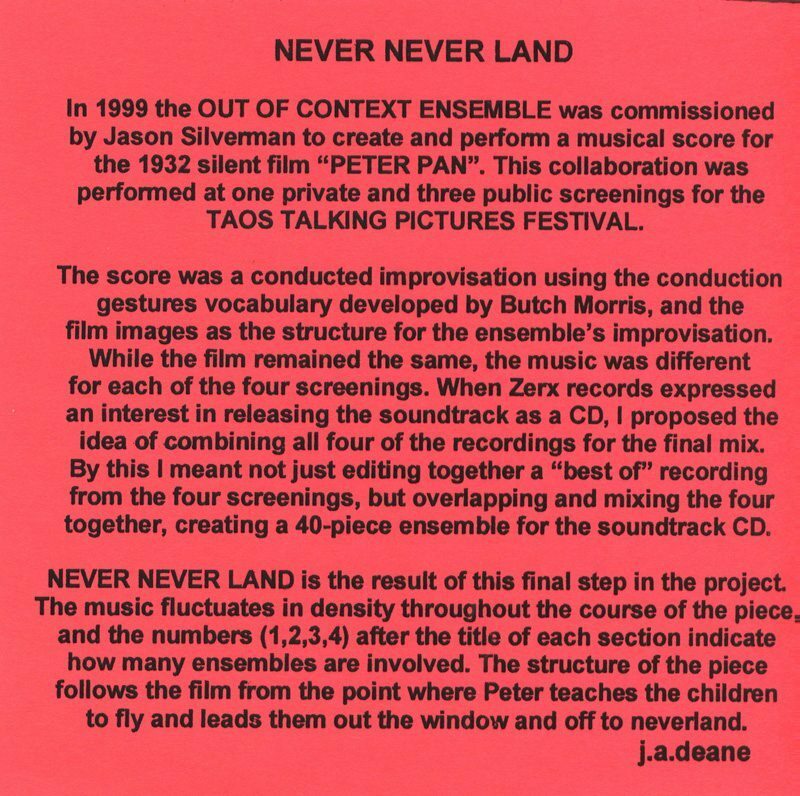 Using Morris’s conduction system, Deane led a 10-piece ensemble in accompaniment to four screenings at the Taos Talking Pictures Festival of the 1932 silent film version of Peter Pan. The final mix includes some sections drawing on only one of these four performances, while others stack two, three or all four. The disc begins and ends with high-density, four-ensemble tracks: too often the result is merely a greyed-out miasma, especially the predictably loud climax near the end on the 18-minute “Rescue.” But the middle sections of the CD, drawn from only one or two ensembles, are quite special, a hazy, almost naive-sounding dreamscape whose most prominent elements are soprano sax, harp and strings. As the CD’s lovely coda, “Home Again (For Now),” slowly drifts away and dissolves, the last thing one can make out is the faint sound of pipes.